is Leopoldstrasse 25 in Munich Schwabing, Germany. Appointments by request. All private and statutory health plans accepted. 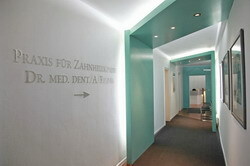 is what we have been practicing at the dental clinic at Leopoldstrasse 25 in Munich for over three decades. 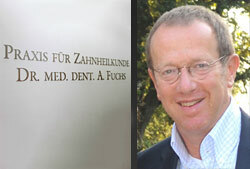 Dr. Fuchs has been running this prestigious dental clinic with its own laboratory since 1990. 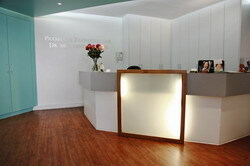 Spaciously designed rooms and ultra-comfortable American-brand patient chairs create a relaxed treatment atmosphere. Preserving the health of your teeth is our primary objective - long-lasting maintenance therapy is certainly preferable to any replacement strategies. Individualized preventative care (professional intensive teeth cleaning and periodontal treatment) not only serves to maintain your oral health, but it is scientifically prooven that chronic gingival conditions are related to cardiovascular diseases and diabetes. Of course, we also care for your restorations (fixed, removable or implant-retained) utilizing the latest dental technology that meets the standards of modern dentistry. Our diverse range of services cover complex treatment cases, restorations of abraded dentition, esthetic permanent fillings, root canal therapy (endodontics), implantology, bleaching and children's dentistry, among others. 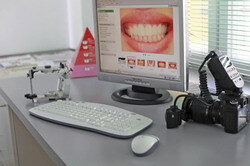 All tooth preparation work is carried out exclusively using magnification glasses. If desired, sedation by anesthesia is used to help you simply "sleep" through more complicate procedures - a service we render in cooperation with our maxillofacial surgeons. Utilizing modern digital x-ray diagnostic equipment, we can instantly visualize and analyze images on the monitor (and thereby make a quicker diagnosis). This reduces your radiation exposure by up to 90%. All precision cast models for full ceramic veneers, inlays and onlays, restorations and bruxism guards are fabricated and articulated in our own laboratory. Similarly, minor repair work is done on the same day. Further dental lab work is fabricated by highly qualified master dental technicians located in the greater Munich area only. Equally guaranteed are close, long-term partnerships with outstanding oral and maxillofacial surgeons (implantology) and orthodontists (tooth alignment, invisible brackets, Invisalign). It is understood that we will discuss your case, as mandated, with your internist / cardiologist.